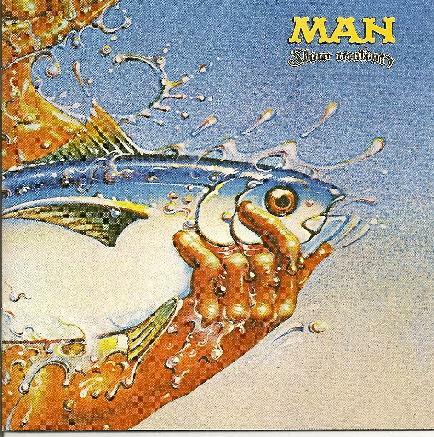 Another classic Man album on CD reissue - faithfully remastered with six added bonus tracks from the Esoteric label. Recorded in late 1974, then released in early 1975. Belongs in a permanent place right alongside of your copies of some of the other Man reissues - like the self-titled one, ' Do You Like It Here Now, Are You Settled In?' and ' Live At The Padget Rooms, Penarth'. See my reviews of those three in the Aural Innovations issue #38. ' Slow Motion' might sound a bit different than the earlier Man efforts, but that's because keyboardist Malcolm Morley had left the band and Man was now a four piece rather than a five piece. Don't get me wrong, ' Slow Motion' is still a worthy release of Man's lengthy catalog. I thought that the opener - "Hard Way To Die" - had a nicely played instrumental segment late in the song. "Grasshopper" has a a good flow to it, with an awesome guitar passage. "Rock And Roll You Out" is an upbeat blues rocker as only this Welsh band is able to pull off. I liked the catchy "You Don't Like Us", as well as the amazing sounding "Bedtime Bone" and the melodic "Rainbow Eyes". That's it for the 'original' LP. This CD reissue is one of those cases where I think I like the bonus material as much as I enjoy the actual album, if not more. First, there's a previously unreleased version of "Rock And Roll You Out" and a live track from May, 1975 - "A Hard Way To Live" - which is great. Some of you know how much I dig live CD's as such. Then the last four songs are from an April, 1975 gig in Berkeley, California that truly wales! This 4-track snippet more than makes this reissue a must-have. I found myself playing these last four songs over several times without playing the entire disc. If you're a true Man fan, you'll thoroughly dig "Hard Way To Die", the rocking "Somebody's Calling", "Many Are Called, But Few Get Up", and this other live version of "A Hard Way To Live" just as much as I did. This particular Man title reminds me of the Allman Brothers Band (at times), Savoy Brown and Wishbone Ash. It comes with a sixteen-page CD booklet with detailed info on the making of ' Slow Motion', plus actual photo-copies of studio notes, newspaper ads, etc. For more information you can visit the Esoteric Recordings web site at: http://www.cherryred.co.uk/esoteric/artists/man.htm.